Made of polypropylene yarn, you can enhance your interior decor with this stunning rug from Home Dynamix. 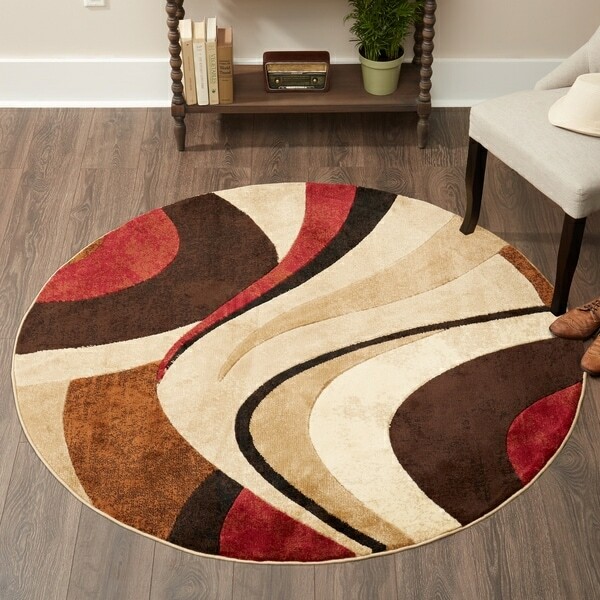 This Tribeca Collection rug features an abstract pattern that will blend with any home's style, and the tan, red and brown coloring allows it to accent any color scheme. Add to your home with this beautiful rug made in Turkey. Love this rug exactly like the picture. Fits perfect in our den on our wood flooring. Colors just pop. If you ordered this rug you would not be disappointed. Fits our space perfect. The size and style is exactly as described and pictured. We've had it a good 6 months and it has held up well. I definitely recommend getting a non slip pad for underneath the rug though if it is going on a smooth surface. Ours sits on a vinyl surface and needed the mat. It doesn't slide with that combo though! I purchased this rug for a circular vestibule outside our master bedroom; perfect fit; perfect color; perfect quality. Perfect addition to my living room. The colors are vibrant, it looks fabulous. This rug is very good quality and even more beautiful in person. I purchased it for my master bathroom and it looks amazing. I bought this for a small home office. It has a very low pile which lets you roll your desk chair over it without a problem. My husband was very pleased.Score one for me ! !